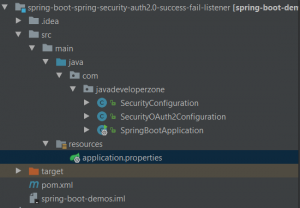 In this article, We will learn Spring Security Oauth2 Success or Failed event listener. Auth2.0 authentication protocol is nowadays very popular for token-based authentication. OAuth workflow is consist of mainly two components one is authentication server and another is resource server. In this article, We will learn how we can trace event while the user tries to get authentication token, the user may get success or failure and sometimes it’s important for the application to maintain that audit related to auth2 authentication success and failure. So here we try to explain how we can audit success or failure event to OAuth2 tokens. For fauiler event, we can to check specific reason like Bad credencial or user locked using instanceof AbstractAuthenticationFailureEvent or we can also register specific event like AuthenticationFailureBadCredentialsEvent, AuthenticationFailureLockedEvent ect. // write custom code here login failed audit. 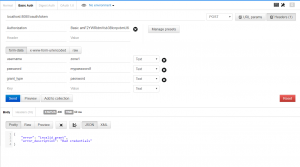 Here is spring security-related configuration like in memory users. * Created by JavaDeveloperZone on 09-12-2017. Let’s try to get access token so we can check LOG for authentication token succeeds. Here, We have entered the wrong password so we can check failed event listener. 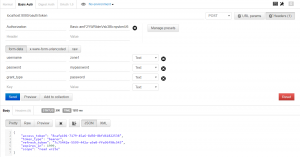 In this article, we have seen that how we can track OAuth2 authentication success and failed using @EventListener. Spring Security automatically trigger respective listener while authentication gets success or failure.